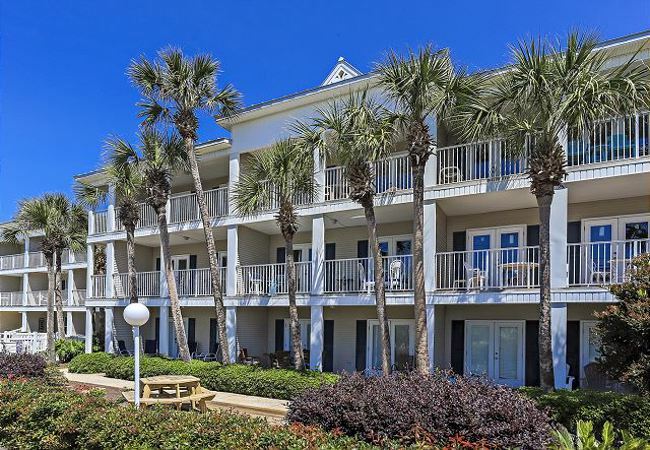 Located on Destin’s quiet side and directly across the street from the Gulf of Mexico, Crystal Beach is home to Grand Caribbean East a beautiful three-story condominium that offers a tropical paradise setting and conveniences sure to please the entire family. Just steps from the sugar-white sandy beaches overlooking the sparkling waters of the Gulf of Mexico, this Emerald Coast gem is a great place to land for a beach vacation to Northwest Florida. Grand Caribbean East and West each feature a lush, tropical landscape with a bit of old-world charm making it the ideal setting for all types of vacationers. Each one- or two-bedroom unit is cozy and nicely decorated with private balcony or patio. Each of these amazing Destin vacation rentals sleeps up to six people, and some have hall bunks. The views from the private balconies in each unit are breathtaking, while the decor is light and inviting. A pool, whirlpool spa, barbecue grilling facility, and on-site guest laundry complete the package for Grand Caribbean guests, not to mention the exhilarating views of the coast that lies directly across the street. Enjoy the five-mile bike path that runs along the beach and the shopping and dining opportunities that are located nearby. Additionally, guests will find plenty of shopping, dining and entertainment in Destin within just a few minutes’ drive. This quiet side of Destin is the perfect spot for a renewing beach escape along Scenic Highway 98 or choose to stay close and soak in the sun, enjoy the natural beauty of the area and let the gulf breezes refresh your mind and body.